Verizon BlackBerry Tour trackball issue solved | BlackBerry Blast! 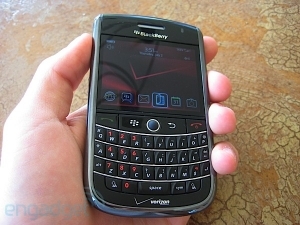 Many users were reporting problems with the trackball on the recently released BlackBerry Tour on Sprint and Verizon. Sprint said only early units had the problem and Verizon is now saying pretty much the same thing. Engadget got a response from Verizon and it appears that the problem has been acknowledged, and solved. "Early on there was an issue with the trackball that affected a small percentage [of] the early production units -- far less than industry norms. The issue was detected early, addressed immediately and is no longer an issue. Returns on this device are some of the lowest among any of our smart phones." If you have one of the early units with a trackball issue, get back to your Verizon store and get yourself a new one.